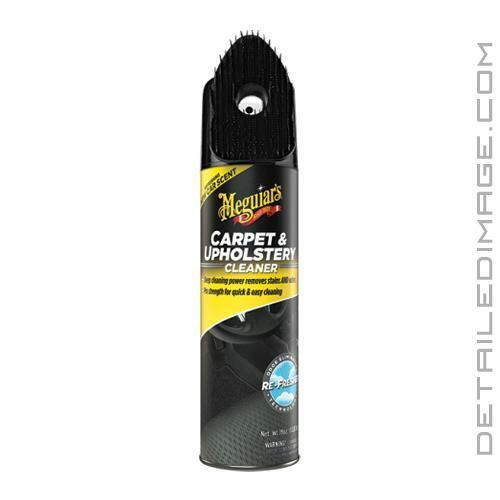 The Meguiar's Carpet and Upholstery Cleaner with Brush is a professional strength carpet cleaner designed to remove stains and odors! Carpets and upholstery can easily become dirty with all of the grime, food crumbs, oils, dirt, etc that we throw at it every day. With the Meguiar's Carpet and Upholstery Cleaner, you have an aerosol can that produces a thick foam. This foam encapsulates contamination and breaks down stains. At the top of the can you have a thick bristled brush, providing you with extra cleaning power to break down and tough dirt and grime. Simply spray the foam onto the desired area, and scrub with the brush if desired for best results. Once finished the foam will dry quickly and does not leave behind any residue. Best yet, this formula smells like a fresh, new car. If you are looking to clean your interior carpets or upholstery, give the Meguiar's Carpet and Upholstery Cleaner with Brush a try today! Whether you are looking to clean one stain or freshen the entire interior, Meguiar's Carpet and Upholstery Cleaner is perfect for the job. Active foam quickly penetrates & dissolves stains from the bottom up for deep down cleaning. This effective blend of cleaners and surface active agents removes the toughest stains and helps to restore a like-new appearance on carpet and upholstery. Meguiar's Re-Fresher Technology permanently removes existing bad odors through chemical bonding at a molecular level. SHAKE WELL. First, test for color fastness on an inconspicuous area and let dry. Remove loose dirt by vacuuming and blot wet stains with a clean absorbent towel. Spray evenly onto area to be cleaned. Allow foam to penetrate for 15-30 seconds. Agitate with included brush or a towel. Blot area with a clean dry towel until area is clean and slightly damp to the touch. Allow to air dry before use or covering.